if you do, read on.Kevin Harney, Pastor and AuthorOnce again, Gary Thomas challenges me to live passionately for God and to apply his transforming power to my daily decisions.Kay Warren, Executive Director, HIV/AIDS Initiative, Saddleback ChurchThe Beautiful Fight will energize your life and your church. It will inspire you, equip you, and challenge you to delve ever deeper into what it means to be a truly holy believer, transformed into the image of Jesus Christ. Discover just how radical Christian transformation can be, as you learn to see with new eyes, think with a new mind, and feel with a new heart. Thomas rallies you to the Beautiful Fightthe struggle to fully express the wonder and life-changing power of Christ in this world through every aspect of who you are. Gary Thomas is a writer in residence at Second Baptist Church in Houston, Texas, and an adjunct faculty member teaching on spiritual formation at Western Seminary in Portland, Oregon and Houston Theological Seminary in Houston, Texas. He is the author of 19 books, including Sacred Marriage, Sacred Pathways, Cherish, Sacred Parenting, and the Gold Medallion Award-winning Authentic Faith. He has a masters degree from Regent College, where he studied under Dr. J.I. Packer, and was awarded an honorary doctorate in divinity from Western Seminary. Gary has spoken in 49 states and 10 different countries. He has appeared numerous times on various national radio and television programs, including CBN, Focus on the Family and Family Life Today. 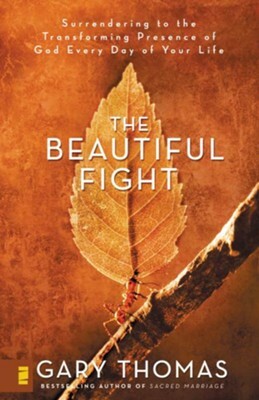 Bestselling author Thomas (Sacred Marriage) based the title for this book on the way Orthodox Christian fathers translated Paul's words in 2 Timothy 4:7: "I have fought the Beautiful Fight." Thomas is concerned that Christians often focus on "mere morality" and wants to introduce readers to a more experiential, compelling Christianity that focuses on transformation, not simply conduct. This Christianity emphasizes the ascension of Christ, the presence of Christ with us, the need to listen to God daily and the fact that God is already on our side-we do not need to earn his favor, although our actions can please him. Walking through this spiritual primer, Thomas addresses a range of attitudes and actions that contribute to Christ-like living. He draws on the stories and teachings of Christians past and present, including St. Francis, Teresa of Ávila, John Calvin, C.S. Lewis and J.I. Packer. Well written, this is largely very familiar evangelical teaching with a subtle shift. Thomas may have done better to focus more on his distinctions with traditional evangelical thought, though readers will likely welcome his valuable perspective on living the Christian life. (Nov.) Copyright 2007 Reed Business Information. I'm the author/artist and I want to review The Beautiful Fight: Surrendering to the Transforming Presence of God Every Day of Your Life - eBook.